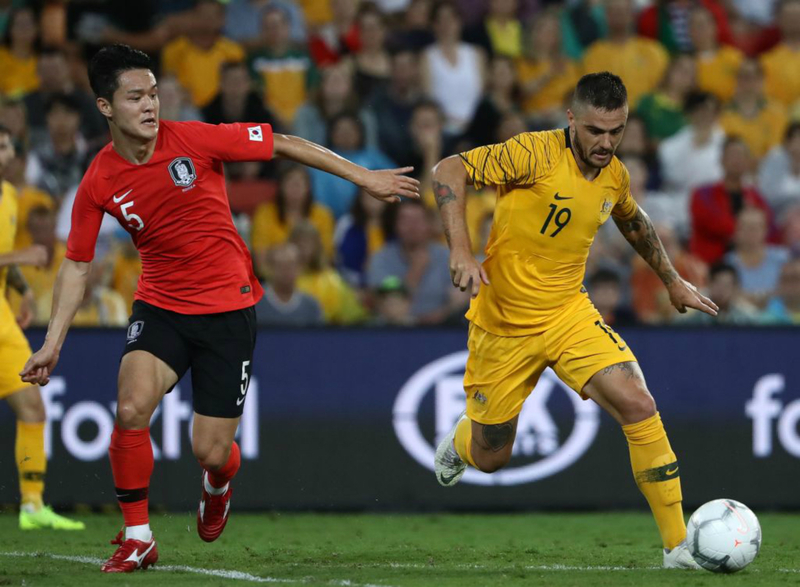 The Western Sydney Wanderers right back was one of Australia’s best performers in an exciting 1-1 friendly draw with Korea Republic in Brisbane on Saturday evening. The mood could have been different afterwards if it were not for Massimo Luongo’s last-gasp leveller but Risdon felt the Caltex Socceroos were well worth a point - at least - after a performance in which they registered 22 shots on goal to Korea Republic’s four. “It was a great team performance by everyone,” Risdon said on Fox Sports. “We had a lot of chances and we knew if we just kept playing the way we wanted to play, the pressure would build on them and we would get a chance eventually. “Obviously it [the goal] came from a set piece but it was just that continuous pressure going forward and the movements and the runs that kept them on the back foot and eventually got us the goal. Risdon was pleased with his own performance and said he enjoyed getting forward and expressing himself with the ball. “I felt very comfortable out there, physically and on the ball as well,” he added. “It’s very good to get to know this new style that ‘Arnie’ wants to play. I think it suits me very well.